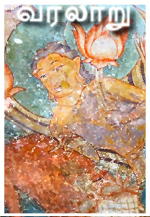 Originally the entire cave temple, including the sculptures, might have covered with paintings, but at present the remnant of the painting is seen only at sanctum and mandapa canopy, mandapa vajana, upper squares of facade pillars, pilasters, potikas, kapota canopy. The animals are goat, bull, dog etc. In the square pattern floral design is formed. Such patterns repeat frequently forming the carpet design. 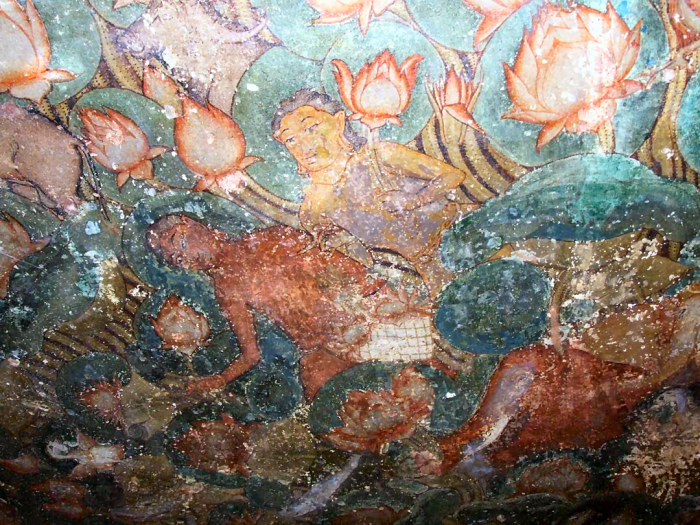 The western side of the sanctum roof is followed with the lotus creepers with flowers as shown in the mandapa roof which is prominent in the south than the north. 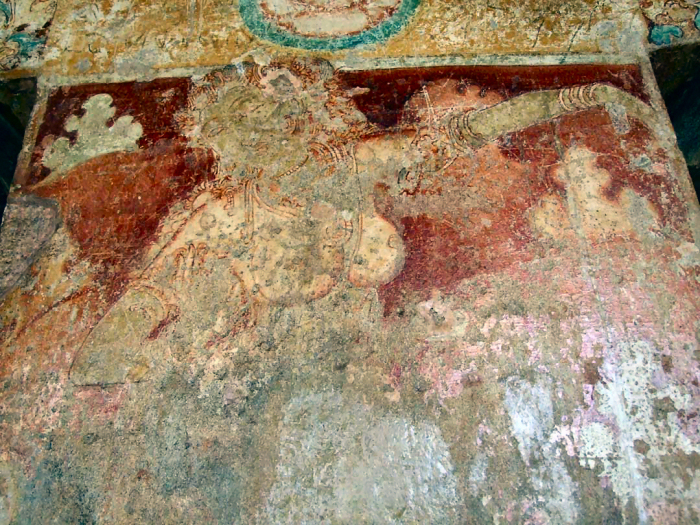 But beneath the upper layer of painting at plaster rid areas another layer of painting is seen. The upper layer might be superimposed over the already existed layer of painting. 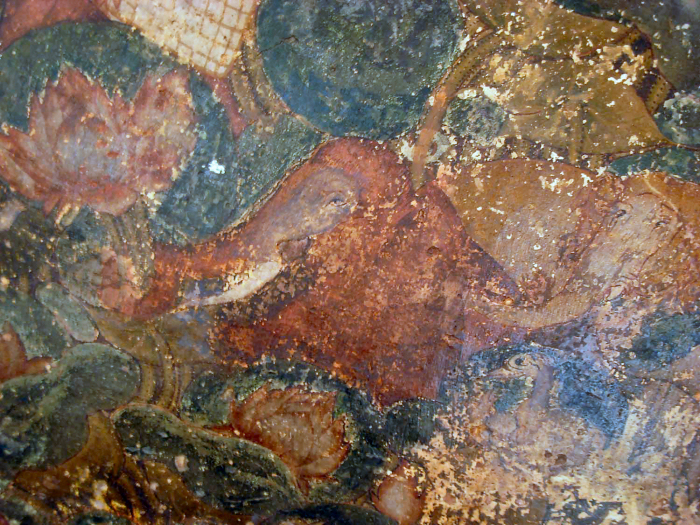 The painting on the mandapa roof is divided into two. The southern part of the mandapa roof is filled with flowers of various sizes scattered throughout in an orange colour backdrop. 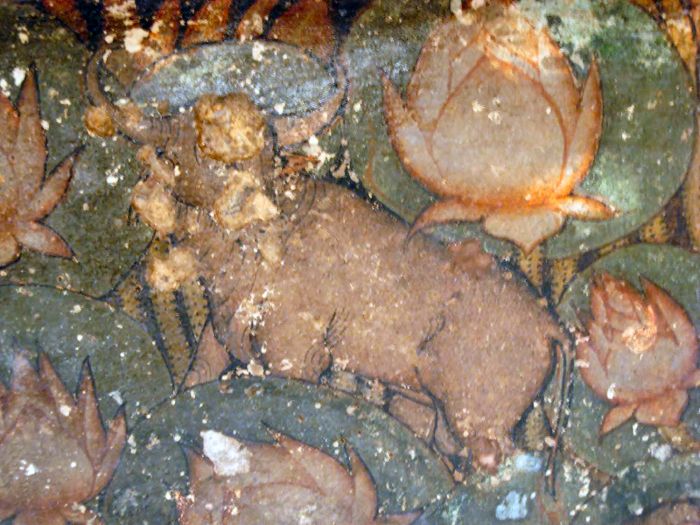 In the centre a fully bloomed lotus is shown while in the edges partially bloomed lotus are depicted at frequent intervals and the rest of the area is filled with small flowers. The flowers are shown inside circular olive colour patches. The rest of the mandapa is portrayed with the theme of the famous lotus-pond. It is a delightful pond with lotus flowers of various stages, lilies, fishes, geese, makaras, buffaloes and elephants. 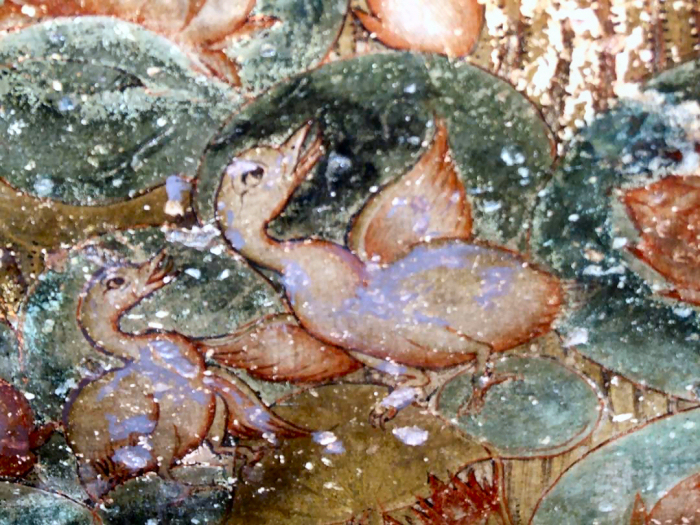 The birds and animals are portrayed amidst the flowers and the creepers. The lotus and lily are shown in various stages of progress – bud, half-bloom and full-bloom. Not only the flowers the leaves are also shown in various stages of progress and for every bloomed lotus a lotus leaf is shown as backdrop. In the northwest corner of the tank two monks in loin wear are wading through the water. One of the monk is dark complexioned carrying a basket filled with flowers in his left hand and plucking the flowers in his right hand. 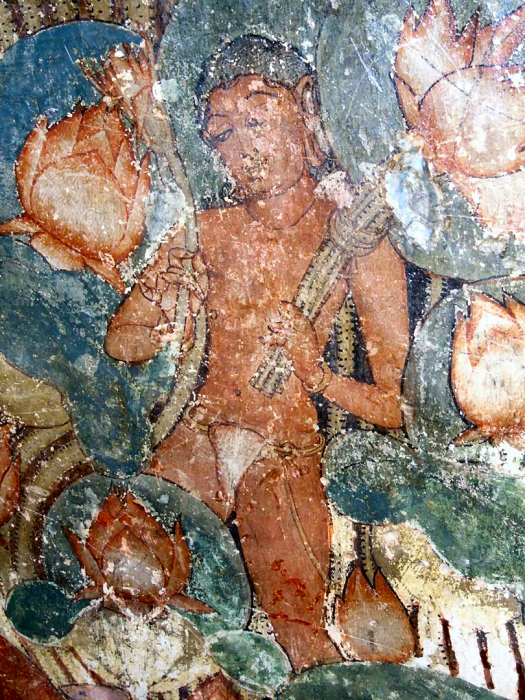 The monk to his left is fair complexioned, carrying a lotus on his left hand resting over his shoulder and the right hand is in pointing gesture. On the western side of the facade, the remnants of paintings are seen in the upper square of the pillars and pilasters, potikas, uttira, vajana and kapota. The faces of the upper squares in the pillars are portrayed with King-Queen and dancers. The northern face of the southern pillar is depicted with the scene of monk meeting the King accompanied by his Queen. The portrait is much worn out, only half of the depiction is left over. The remnants are further spoiled by scratching and scribbling over it. The royal couple looks young and in amicable gesture, the King is seen in the frontage and behind him to his left the queen is depicted. The king is decked with karanda makuta and ornaments in head, neck, ears etc. For the queen, only the head is visible, her locks are arranged as karanda makuta and adorned with ornaments in ears and neck. Comparing the royal couple the monk is visible only as an outline with shaved head and elongated ear lobes. 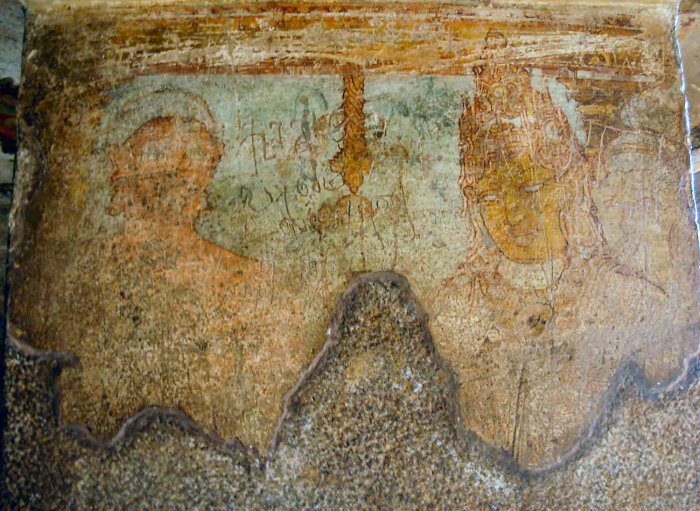 If corroborate with the inscription present to the south of the rock cut cave on the slope of the hillock the royal couple might be King Sri Vallabha and his Queen, the monk might be Madirai Aasiriyan Ilangauthaman. The western face of the northern pillar and the corresponding face of the southern pillar each possess a female dancer, both are much worn out and only half of the painting is left over. Both the damsels are richly ornamented, shown in the midst of the clouds dancing gracefully. While the damsel in the north is showing vezha mudra in her right hand, her left hand raised up and folded near her beast whereas her counterpart is showing ardharechita in the left hand and her right hand is raised up, folded near her breast. Both are adorned with charapali, long beaded ornaments, ornament close around the neck, bangles, armlets, while the damsel in the north is adorned with patra kundalas her counterpart in the south is adorned with circular stone ear-rings and in addition a pendant hara. Both their locks are neatly arranged and decked with flowers and ornaments. Thin eyebrows, mesmerizing eyes, slight grin in their lips adds charm to their poise. On the potikas, the tarangas are alternately shaded with the green and yellow colours. The median patta is finished with green and the scroll inside it with yellow. The faces of potikas are done with scrolls of flowers. 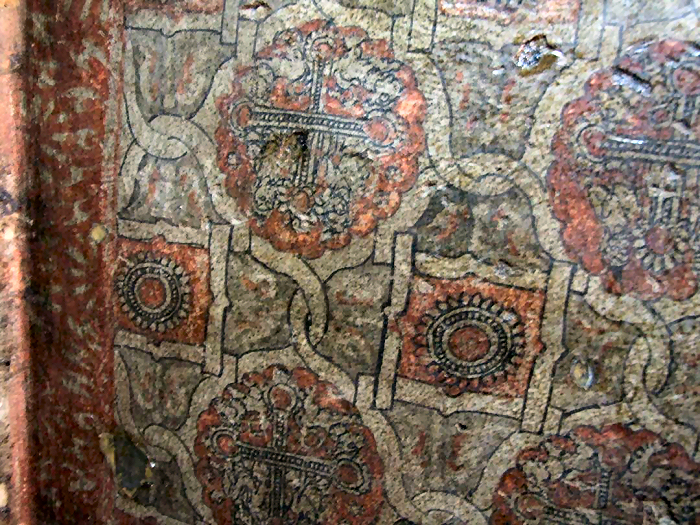 The western face of the uttira is finished with bands of circles, squares, parallelograms and floral patterns. The canopy of the kapota is divided into five sections, swan with heavy plumage is shown in the middle section; on either side the sectioning are filled with red colour floral patterns in yellowish orange backdrop. Inscriptions within the rock cut structure constitutes scribbling over the painting even a letter, a word etc. At two places inscribed over the rock are also seen.8 Scribbling found between Ilangauthaman and the King-Queen portrayal mentions a name ‘Kachamangala Udaiyan’ scribbled in three sentences, and on paleography ground belong to Chola period. (9) Both the pillars on the eastern face of the lower square possess inscription of a word ‘Sri Thiruvasiriyan’ on the northern pillar and ‘Sri Ulogadhittar’ on the southern pillar. (10) Another inscription is seen on the floor in front of the facade is ‘Sriyankaila’. (11) Besides these in the outside on the slope of the mother rock to the south of the rock cut cave also seen small notes of inscriptions. The seventeen line Tamil inscription in versus found on the slope of the hillock to the south of the rock cut cave speaks about the job done by the Madirai Aasiriyan Ilangauthaman related to the rock cut cave for the Pandya King Avanipasekara alias Sri Vallabha (C.E. 815-862). The inscription details about the job done by Ilangauthaman at two of the places. The first part of the inscription details about the construction of a Jain temple at Tharambaimudur and endowment of land for offerings and lamp, 3 ma of land for melugupuram, ½ measure of land for the person who conduct service to the temple etc. The second part of the inscription speaks about the construction of a structural mandapa in front of Arivarkoil, to remove all the defects from there, to embellish the temple to the astonishment of all, to reinstate all the endowments of the previous king, …………the two to be installed, land for lamp, land for the person who conduct service to the temple etc. Finally it ended with the information that Sri Madirai Asiriyan renovated the agamandapa and constructed the mukha mandapa in front of it. Due to the worn-out nature of the inscription most of the information are partially known. The Ilangauthaman inscription details about the job to be done to the two of the mandapas in his inscription. In temple architectural context the ‘mandagam’ denotes the structure in front of the sanctum. The Acharya Ilangautaman speaks about two of the mandapas one ‘agamandapa’ and the other one ‘mukhamandapa’ naturally being the inner and the outer mandapas respectively. Besides for the two of the mandapas he speaks of different job to be done. For the inner mandapa he states ‘agamandagam pudukki’, the term ‘pudukki’(12) denotes renovation to be done to the inner mandapa. For the other mandapa he mentions the term ‘….annal vayil arivar koin munnal Mandagankallaliyarrik kandor ….’ which denotes the construction of a stone mandapa in front of Arivarkoil of Annalvayil. From this inscription it is obvious that there existed a mandapa type rock cut cave for Jain sect and the existing mandapa had to be renovated by removing the defects that it carry and also to beautify it. Apart from that a structural mandapa had to be constructed in front of it. 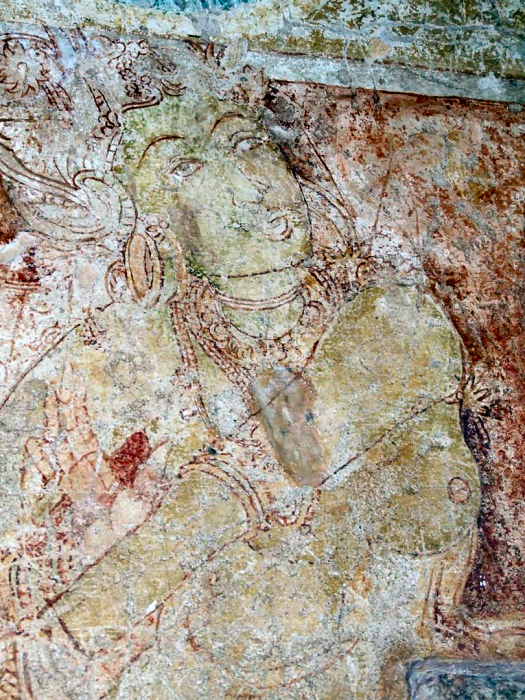 The ‘embellishment to the astonishment of all’ mentioned by the Madirai Acharya might be the painting work done in the mandapa. The installation of two of the something mentioned by the Acharya might be the sculptures carved on the lateral walls of the mandapa. But the circular trace in the sanctum indicates removal of some circular object from the centre of the sanctum. There is lot of possibility of it being the Linga, besides, the presence of the medallion on the roof of the sanctum also supports the view. Circular avudaiyar is also seen at Sathyagiriswara, Okkaliswara in the same district. As like, the medallion feature is also seen at Okkaliswara a Saiva rock cut cave in the same district. Sigaripalleswaram of Melaicheri and Kunnattur III cave of Madurai district(13) are yet other examples of medallion in the roof of the sanctum, where all the three are Saiva sanctums. All these strengthen the view of Sittannavasal being a Saiva Sanctum. Besides through out in the district the Jain establishments are seen only as beds(14) or bas-relief sculptures on the cliff of the hillock.15 Such establishments are also seen in the neighbouring district Madurai.16 All these support the view, the rock cut cave might be a Saiva cave in its origin and met with a changeover as a Jain cave in the later period. But the changeover might have happened far before the undertaking of Ilangauthaman. The rock cut cave as a Saiva establishment might have originated around C.E. 7th or early 8th century. 6. ibid., T.N.Ramachandran, the author state the pair of human figures as Gautama-Ganadharas. 7. Among the fourteen auspicious portents the lotus pond, ‘Manasasaras’ is the one that seen by the queen Trisala when she acquired the embryo of Mahavira in her womb. 13. K.espdp. ,uh.fiyf;nfhtd;/ ‘knfe;jpuh; Filtiufs;’/ ‘kJiu khtl;lf; Filtiufs;’/ lhf;lh; kh/ ,uhrkhzpf;fdhh; tuyhw;wha;t[ ikak;/ jpUr;rpuhg;gs;sp – 18. 14. Sittannavasal, Kudumiyanmalai, Malayadipatti etc. 16. Aanaimalai, Arittapatti, Parankundram etc.